Scythe, by Jamey Stegmaier, is an amazing game. Currently ranked at number 8 in the BGG top 100, Scythe has cleaned up award after award over the past couple of years. When you play the game it is no wonder, as you take control of a nation in an alternative 1920s Europe in which mechs are commonplace and leaders are often spotted with really impressive animals. 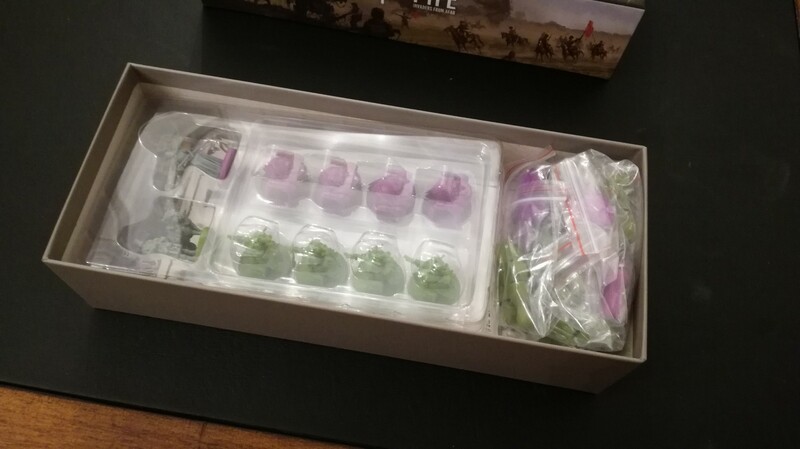 Over the Christmas period I managed to get my hands on both Scythe expansions and so, in the same way as what I did unboxing the full game, I thought it might be interesting to do an unboxing article for both. Today, we will be looking at the first expansion that came out for Scythe (not including the basic board expansion, which is just a segment of the board…that makes the main board bigger), which is Invaders from Afar. What is the Premise of Invaders from Afar? Invaders from Afar was always designed for Scythe as there have always been two more factions on the board than there were in the box. These are Albion and Togawa, one green and one purple, joining the fight to try and get to the Factory. I wanted to include 2 new player mats in the expansion. I realized that some people were going to use the mats to play 6-7 player games no matter the what the box says, so I needed to make sure the game worked for them! And thus, Scythe is now a seven player game with some really cool additional factions. Clan Albion are fearless warriors, lead by Connor and his boar called Max, looking to stop the Factory from falling into the hands of a more powerful faction. The Togawa Shogunate, on the other hand, are lead by Akiko and her monkey named Jiro. They have a personal vendetta against the Rusviets, and suspect they are up to no good. Both are interesting factions and both bring new dynamics to the game. The Invaders from Afar box. First things first, let’s look at the box. This is a half sized box, and has beautiful artwork by Jakub Rozalski that has both an Asian and European feel to it. This is in keeping with the general feel of Scythe, and it looks simply stunning upon a shelf. That being said, we’re not here to look at it on a shelf. Let’s open the box up. And…there we go. There you have it folks, one box unboxed. Isn’t that incredible? No? Okay, well, let’s have a look in a bit more detail then, starting with the documentation. The documentation and wooden pieces. Okay, so like with the main game there are two separate pieces of documentation that come with Invaders from Afar – the solo player rules and the full rules for multiplayer games. These detail both factions, what comes in the box, and even new rules for flags and bombs. I won’t get into those here, but needless to say, they’re pretty cool. Secondly, the big bag in the picture contains all the wooden components for the game. These range from monuments to workers to pawns. I didn’t bother unbagging these as they are covered in more detail in my full unboxing. There is nothing hugely different with Invaders from Afar bar the exact design of the worker meeples. They vary per faction and usually try to incorporate some kind of folk dress (usually a different hat) which makes them more unique. Otherwise the wooden pieces are practically the same. New coins, tokens, and cards. Next, and this is kind of interesting – there are now coins going as high as fifty sheckles a piece. You’ll also notice a few other interesting additional pieces, such as in-game alternatives and flag icons. These act as additional variations to gameplay and, along with the cards, help add more components to the game to both help adapt the game to seven players and to keep the game fresh. Next up we have the player mats of which we have the faction specific mats (underneath) and the standard action mats. I know those aren’t the specific terms, but generalising does seem to help with the comprehension. 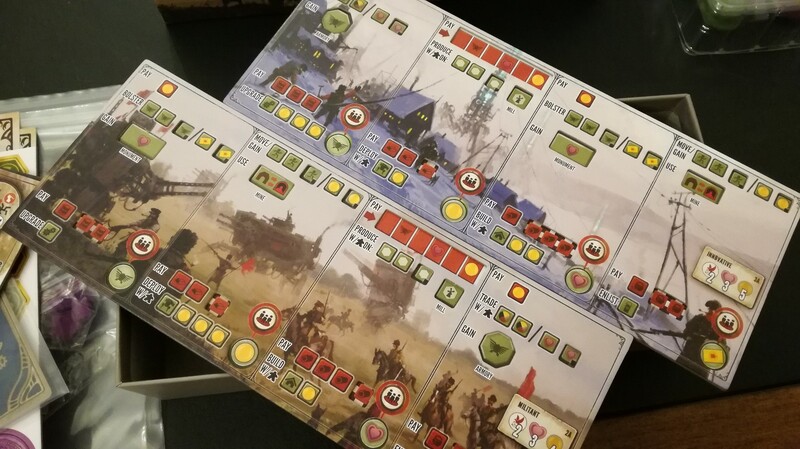 The action mats, as pictured above, detail the different actions a player can do each turn, with both top and bottom actions being available. The exact combinations of these vary per board, adding a really nice asymmetrical element that keeps the game fresh each and every time you play. The player mats are more unique and have the specific faction abilities and mechs on them. Please be aware the following image does contain spoilers. The new faction mats for Togawa and Albion. These detail each hero (and pet), as well as the faction starting power, cards, and abilities. And…that’s all folks. Wait? What? You want to see the minis? Well, if you insist! The miniatures for Invaders from Afar are, it has to be said, just as beautiful as those in the main game. If anything they are even more amazing, even more dynamic, as their main game counterparts. I have to admit that Akiko may be my all time favourite miniature from any board game, ever, and there are some amazing miniatures out there. The way she is posed, with Jiro posed on her staff. It feels fun, fresh, and is a bit of a modelling marvel. She is an absolute stand out piece in the Scythe board game. Clan Albion, on the other hand, have the nicer mechs. They feel more 1920s rustic, and more, as much as I hate to use it as an adjective, Scythe-y. Connor and Max are also fun figures, with Max in particular winning a warm place in our hearts. He’s kind of cute in his own way. As per usual, Stonemaier Games have pulled another set of awesome miniatures out of the bag and I have to take my hat off to them there. They are standout in the world of games. So there we go, a relatively quick and light unboxing to help kick the New Year off. What is the difference between Betrayal at House on the Hill and Betrayal at Baldur’s Gate? If I buy Scythe it’s going to be 100% your doing. I’ve been wanting to play Scythe for a while now, I’m always hearing good things about it. It is such a good game and really easy to see why it is 8th on BGG currently. Let me know if you do get around to playing it – I’d be interested to hear what you think. I’ll have to watch Shut Up and Sit Down’s review of this thing tonight. Everyone seems to find it to be an amazing game. It is 😀 No Pun Included does a great review of it as well.